On this episode of Christina’s “Street Feast” series, Onetrip superguide Dat brings out all the facts on banh trang nuong, aka Vietnamese Pizza. 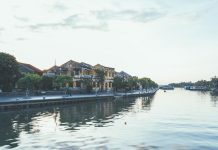 On the banks of the Nhieu Loc Canal, an artery of the great Saigon River, is a section of Ho Chi Minh City bursting with life. During golden hour, this area of town brings people together from all walks of life looking to take part in the number of recreational activities found alongside the canal. You’ll see grandpas hanging over the railing, patiently babysitting their fishing rods, little children skipping down the red brick-lined sidewalks, and middle-aged women breaking a sweat at one of the many free outdoor workout stations that are littered all over the promenade. 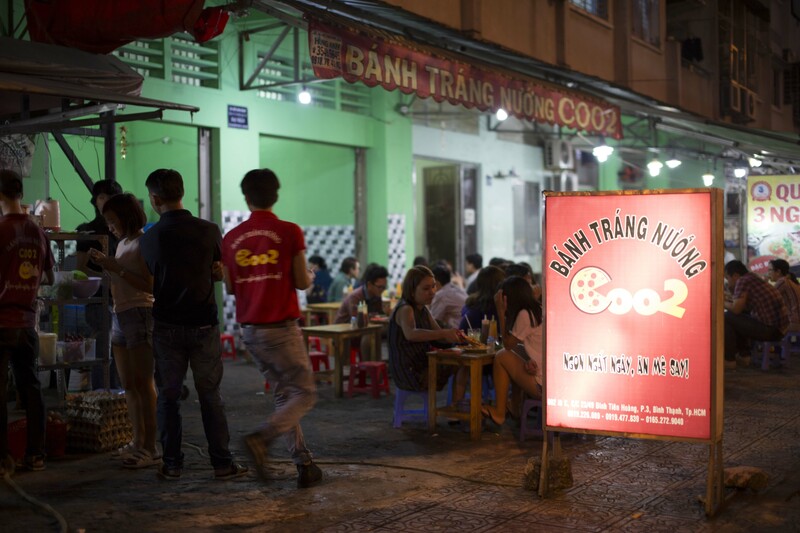 Be careful of getting run down by the throngs of college students and couples marching their way over to Saigon’s most popular Vietnamese Pizza spot, Banh Trang Nuong C002, located right across the street. Some of them are gluten-free pizzas! It takes three minutes to grill, instead of 30 minutes to bake like a pizza! There is a vegetarian version for this. This version is the most basic form of banh trang nuong but there is no definitive “traditional” way to make banh trang nuong. Because this dish was an invented out of resourcefulness, its ingredients are more about catering to the masses than following a set recipe. 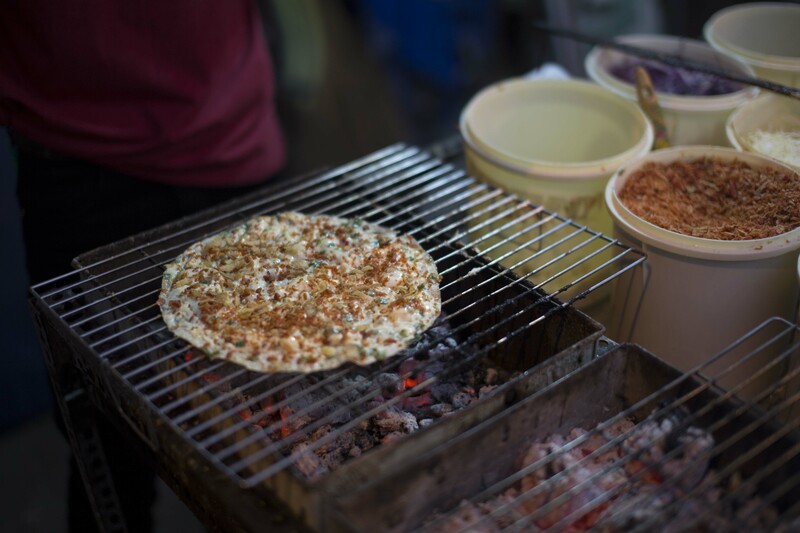 When Vietnamese pizza was first created by street side vendors, they topped rice paper —the essential building block of most foods here in Vietnam— with whatever cheap ingredients they had access to, resulting in the birth of this now famous snack food. And you cut it with scissors instead of knives! The two most popular styles of banh trang nuong come from Phan Rang and Dalat, but it is widely eaten all over Ho Chi Minh City. 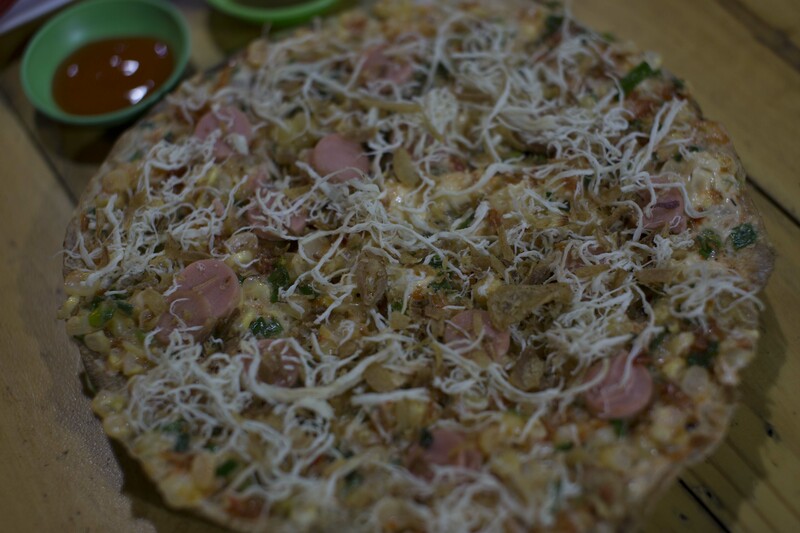 The Vietnamese Pizza eaten in Saigon is a combination of both these styles. Phan Rang’s coastal location influenced the use of dried shrimp while you see that the Saigon version takes a cue from Dalat’s proclivity of piling on a hearty amount of toppings. 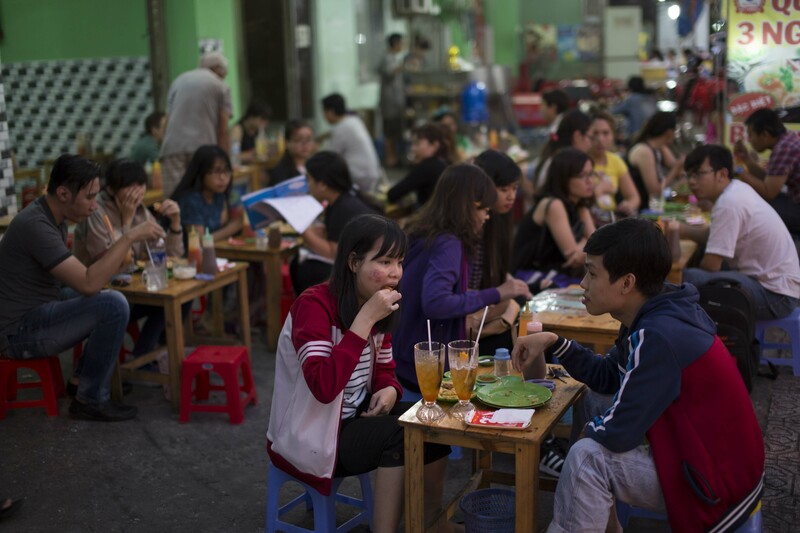 In Saigon, Vietnamese Pizza hawkers flock to District 3’s Turtle Lake Roundabout, District 1’s Reunification Park adjacent to Reunification Palace and the Nguyen Hue Pedestrian Street. There might be one or two vendors out selling before 4 PM but the majority of sellers rely on the darkness of night to set up shop because it is illegal in Saigon for unlicensed vendors to sell goods. The grilling trays are portable, making for a quick getaway just in case police are spotted. Banh Trang Nuong C002 is a proper Vietnamese pizza parlor where, unlike street-side spots, you’ll be eating your food at an actual table with a full operating wait staff at your beck and call. The tagline for the joint is “ngon ngat ngay, an me say.” It’s so good, you’ll die. It’s a bold statement but from the looks of it, no one ever leaves an empty plate, which is a telltale sign of just how good it is. The restaurant has over 40 different topping combinations to choose from. We opted for an updated version of the basic banh trang nuong, with additional toppings including hot dog slices, grated cheese, shredded chicken, and corn. 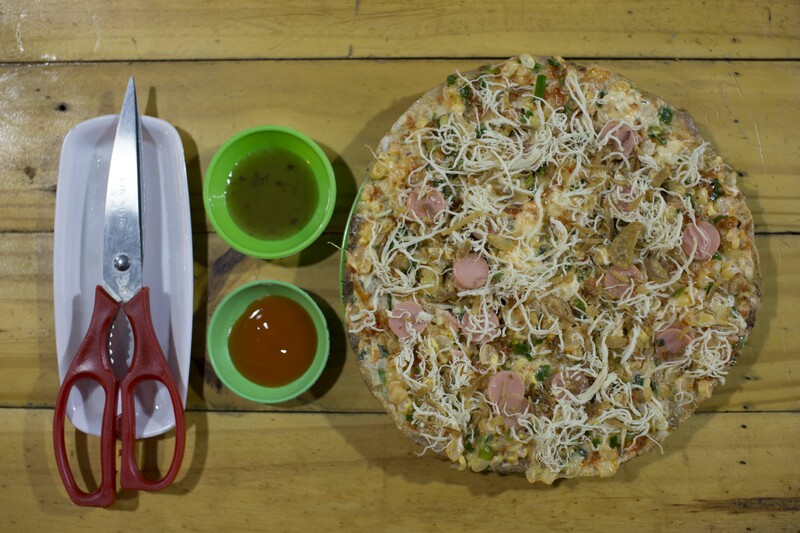 One order of Vietnamese Pizza came out to only 20,000 VND (1 USD). No wonder college kids love it! Banh trang nuong is finger food. On the streets, vendors will fold it up like a taco and wrap it in old newspapers for you to take away. 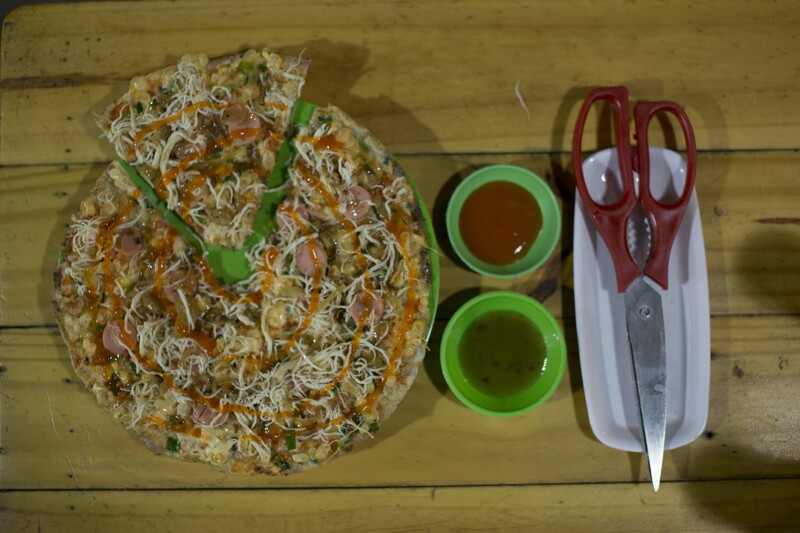 When dining in, the Vietnamese Pizza is served open face and cut into slices with kitchen shears instead of a knife. Fillings vary from different vendors. 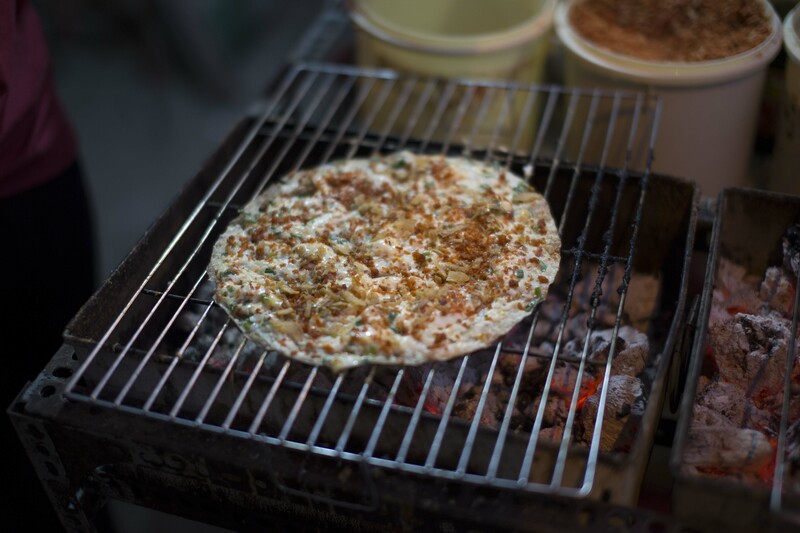 Even though you’ll see banh trang nuong being grilled on the side of the street at all hours of the day, Vietnamese Pizza is a dish best enjoyed after the sun does go down. Bring a group of friends with you —the more the merrier— and take part in the revelry. The environment at this specific Vietnamese Pizza joint is thriving with youthful energy, so expect it to be loud and chaotic. The pizzas are quite light but if you order a few of them, they’ll fill you up just fine. This is a great Friday night activity and perfect if you’re in the people watching kind of mood. Weekends are packed so get there around 7ish to make sure you have a table, especially with a big group. 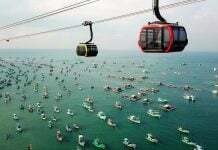 Enjoyed this article and want more fun information on what to see, do, and eat in Vietnam? 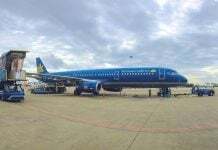 Follow us at the Christina’s Blog!